Move it on up - to aspirational high ground! Realize true luxury. 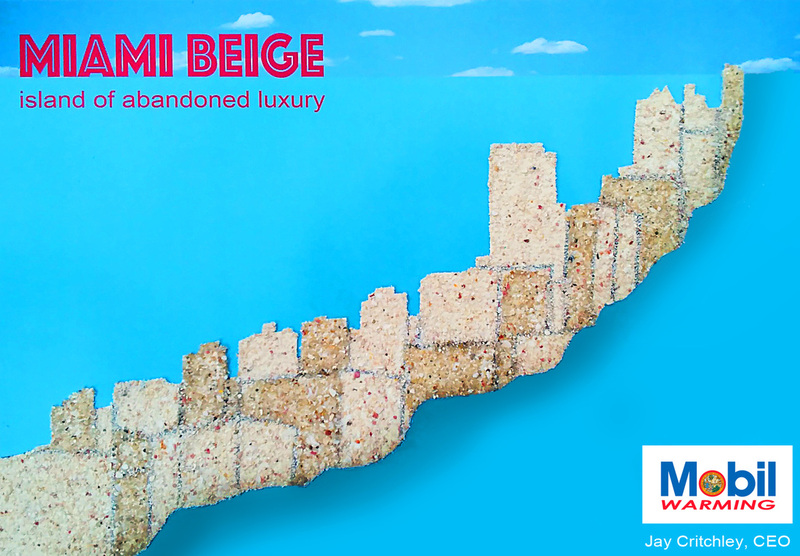 Experience this sand-encrusted, entombed, island of sumptuousness, a post-petroleum haven: Miami Beige – island of abandoned luxury. Enjoy innovative, border-secure, sustainable island living with all the comforts you deserve. Its Coastal Living resort architecture features an eco-friendly beach-sand patina, a nostalgic reminder of yesteryear’s Sunshine State. Indulge in opulent high life on this last, rarified, car-free outpost in South Florida with ocean views from every lookout. Amenities include solar powered incinerator toilets, potable drinking water, yoga and rumba classes and 24/7 heliport services to other “carried interest” island retreats. And, indoor beaches, free of jellyfish and sharks! And solar powered sump pumps in every residence.